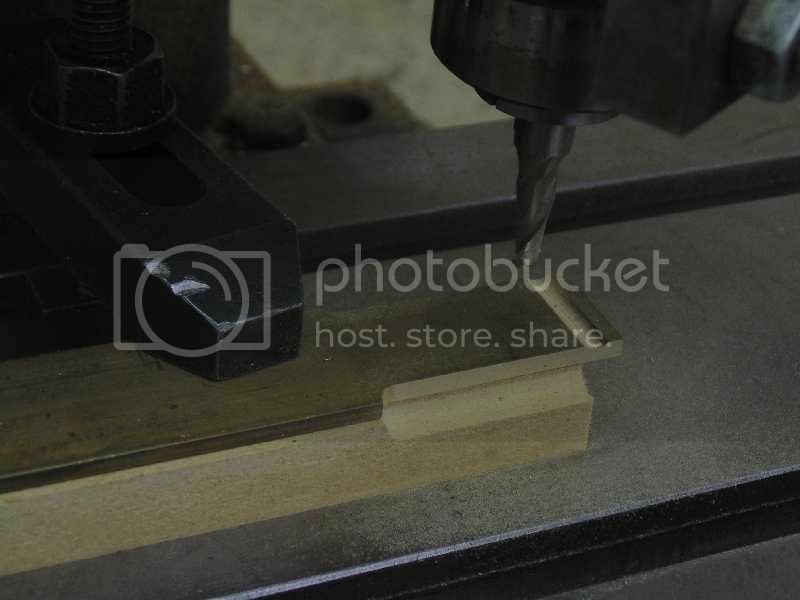 Start with a 1/2" long slab of 1-3/8" diameter round stock. Chuck in the three jaw chuck. Drill and ream to 5/32" diameter for the axles. Face turn the outer hub to 3/8" diameter and 0.069" deep. The .069 hub depth allows for a 0.010" side to side clearance of the wheel sets in the frames. Next turn a shoulder that serves as the wheel rim. Leave the rim turned straight for now. The 3 degree taper will come later. Turn a decorative recess about 1/16" deep. 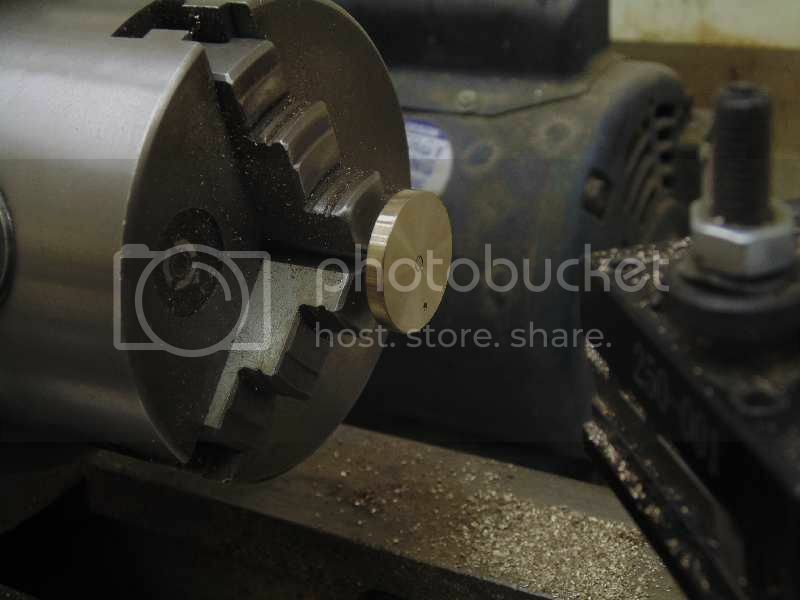 Reverse the wheel blank in the chuck and turn the backside. 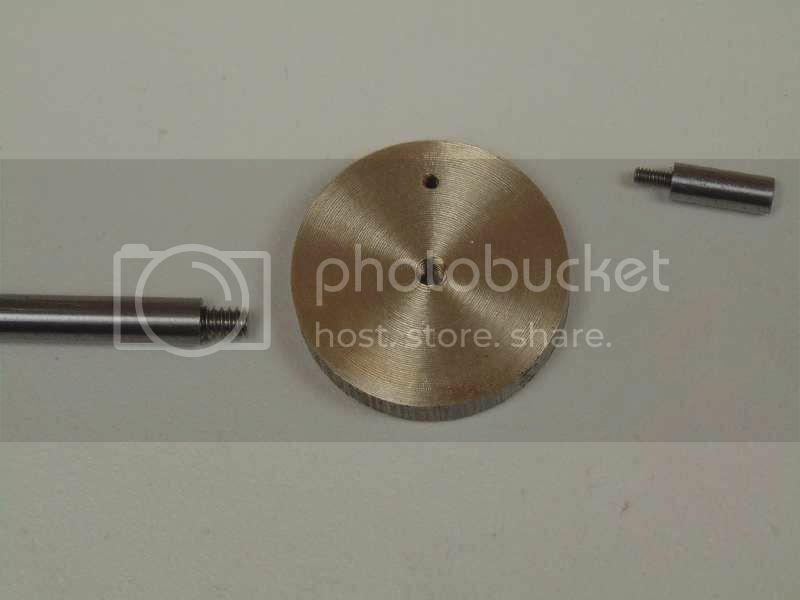 Turn the flange to a thickness of .060". Repeat the process 3 more times. Here are the wheel blanks ready for final turning. 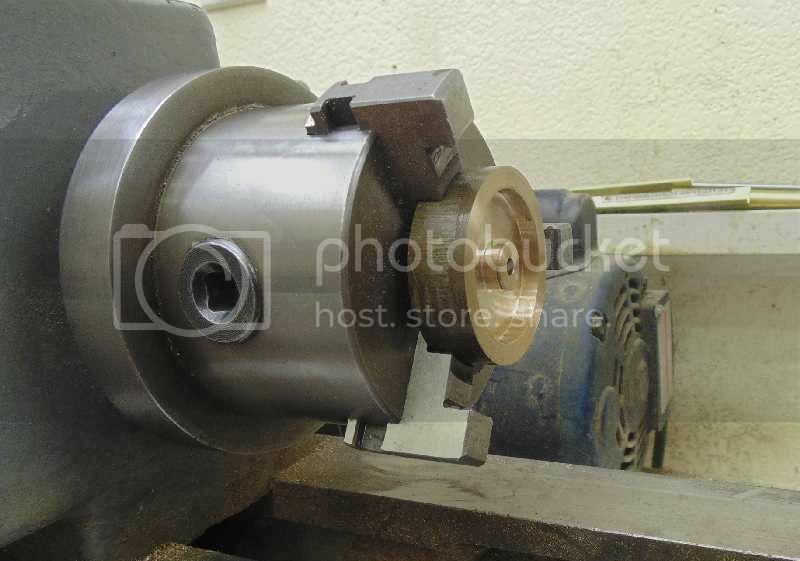 Make a turning spud from a length of the axle materiel and scrap 3/4" round stock. "Loctite" the axle material into the spud body. Tap the end for 4 x 40 machine screw. Mount a wheel blank on the spud. 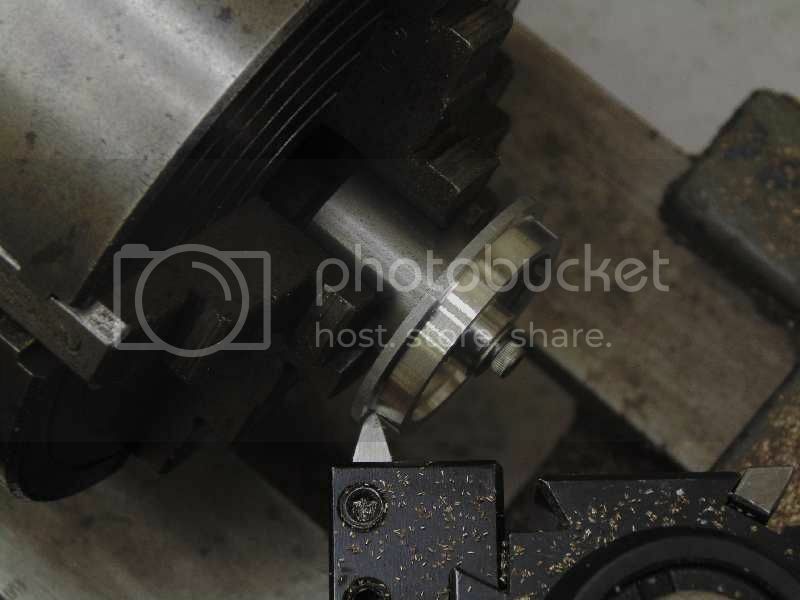 Use a dial indicator to ensure the blank is perfectly centered in the 4 jaw chuck. Set the compound rest on the lathe to 3 degrees. 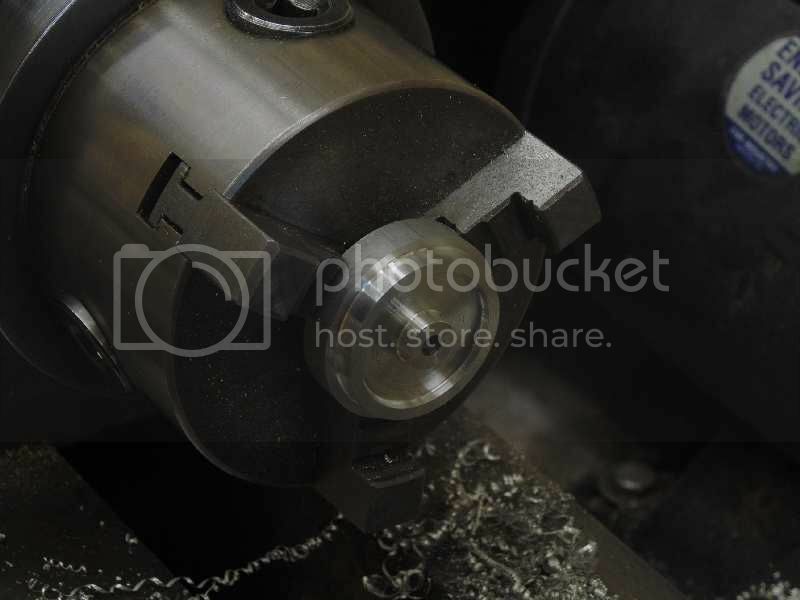 Take very light cuts until the entire rim is tapered to 3 degrees. Be careful not to reduce the root diameter of the wheel. Turn all the wheel rims with the 3 degree setting. The set the compound to 20 degrees to taper the flanges. 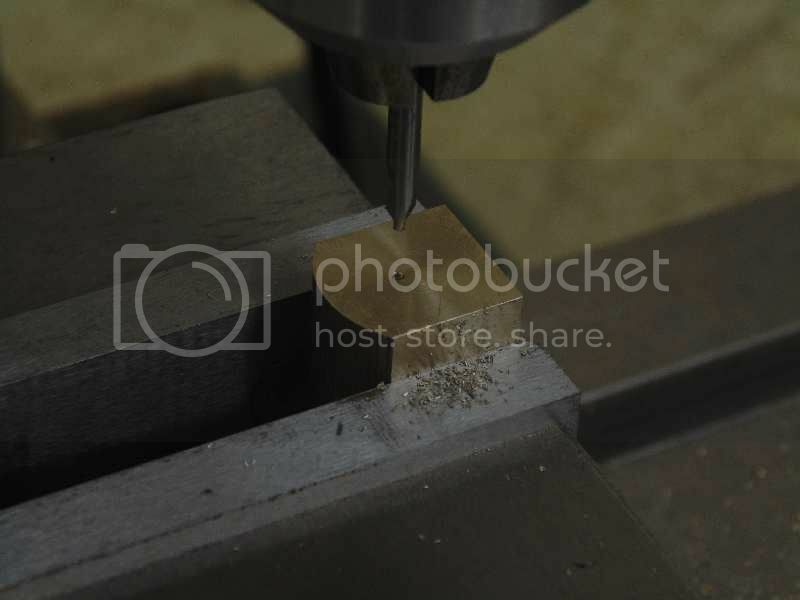 After tapering the flange, use a hand file to round over the flange and break the sharp corner on the edge of the rim. Finish the remaining 3 wheels in the same manner. 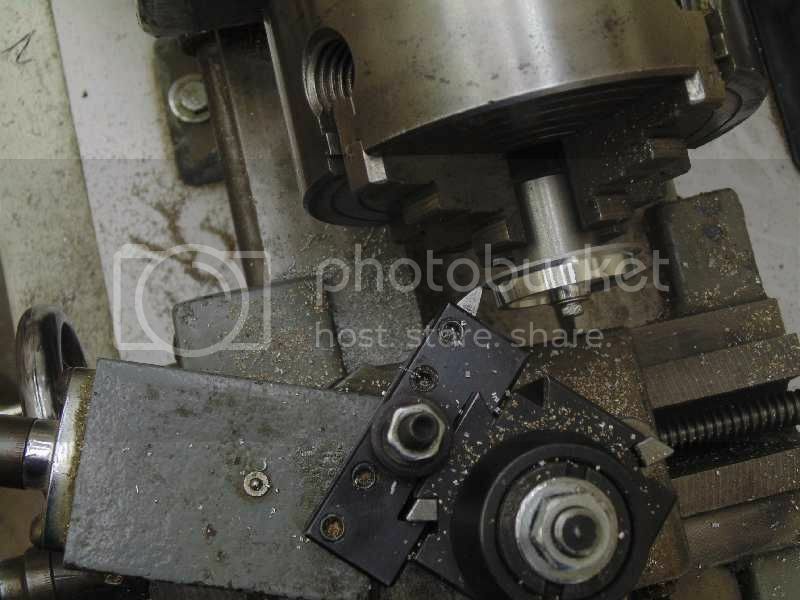 Clamp the wheels in the milling machine vice at about 30 degrees. 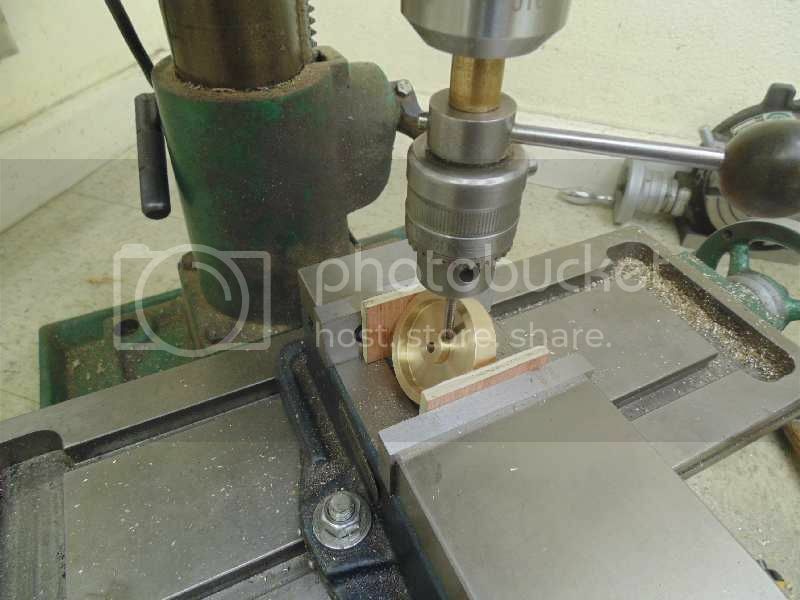 Sandwich the wheel in wood to protect the flanges. Drill and tap for a 6 x 32 set screw. Drill into the corner between the hub and wheel back. Next time is the crank shaft, flywheel and finish up the rolling chassis. 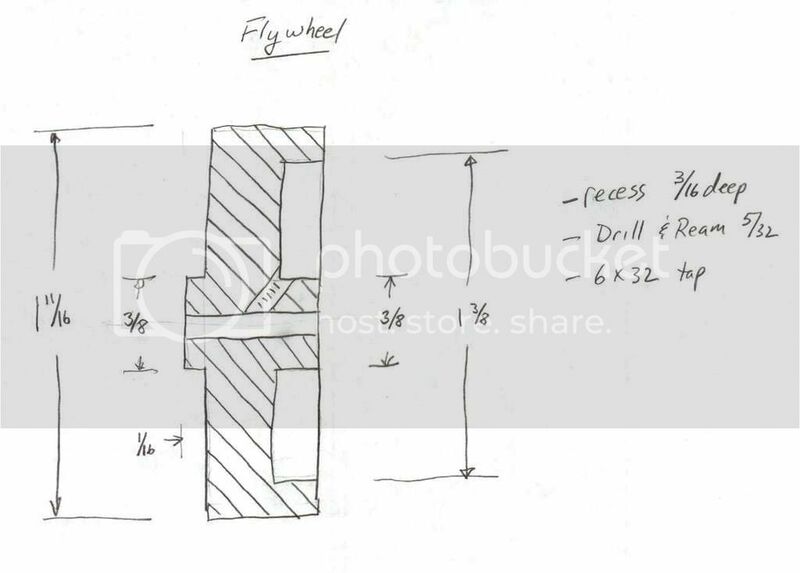 Any metal, except aluminum will do for the flywheel. Aluminum is probably too light. The flywheel has to be a bit robust or the engine will run very "jerky" on the track. This flywheel is bronze. 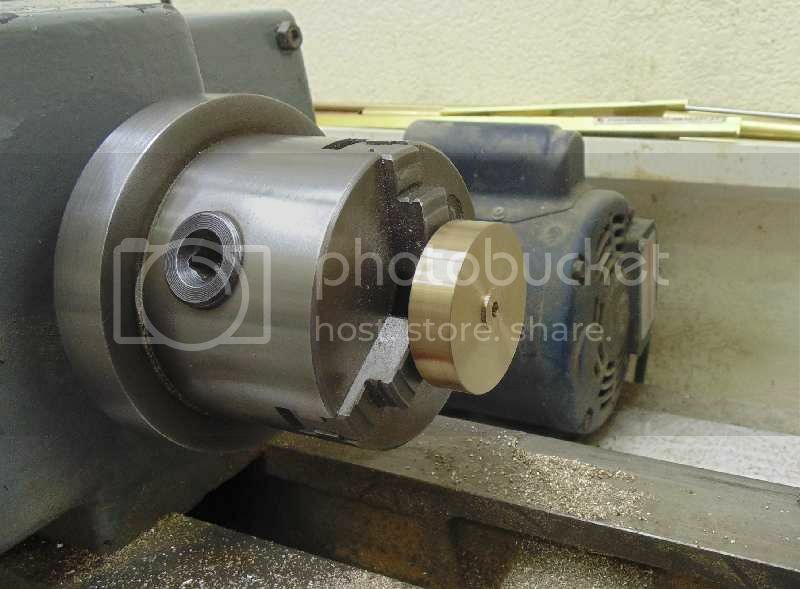 Chuck a 9/16" length of 1-3/4" or 2" diameter stock and turn the outer facing. Grip the flywheel by the inner recess to face the back and turn the rim. Break the sharp corners on the rim with a hand file. Polish the rim to VERY high luster. Everyone will see it. 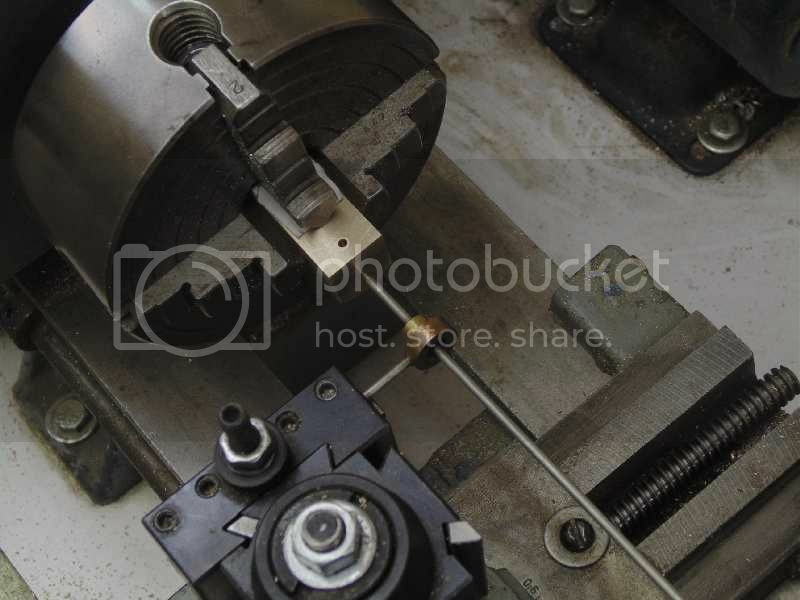 Clamp the flywheel in the mill vice and tap for a 6 x 32 set screw. Same operation as on the wheels. 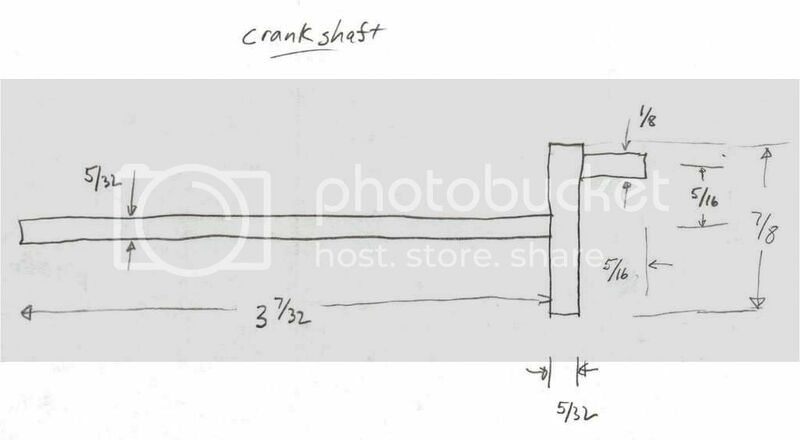 The crankshaft is a 3 piece fabrication. Here is the drawing. The first piece is the main shaft. Cut a 3-7/32" length of 5/32" diameter ground and polished stock. Drill and tap the end of the shaft with 4 x 40. Also cut a 5/16" length of 1/8" diameter ground and polished stock and tap with 0 x 80. 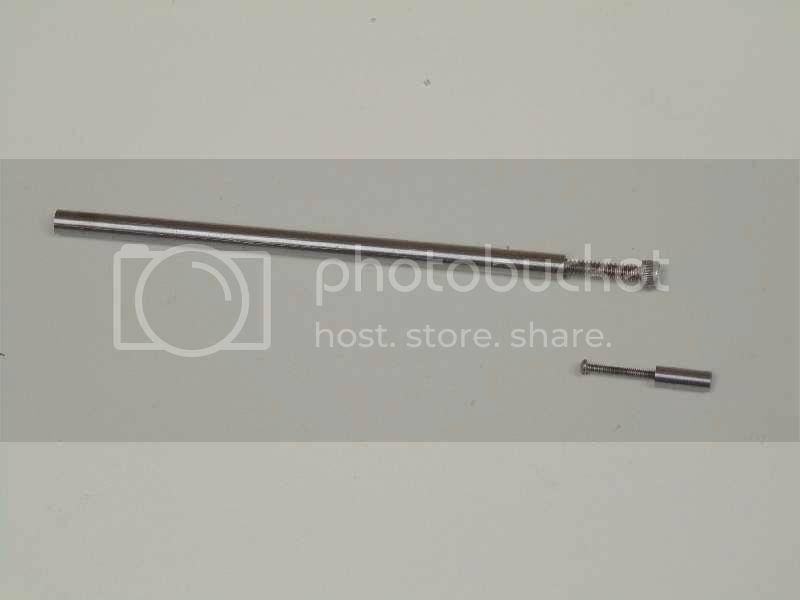 This is for the wrist pin. "Loctite" machine screws into the ends of the shafts. 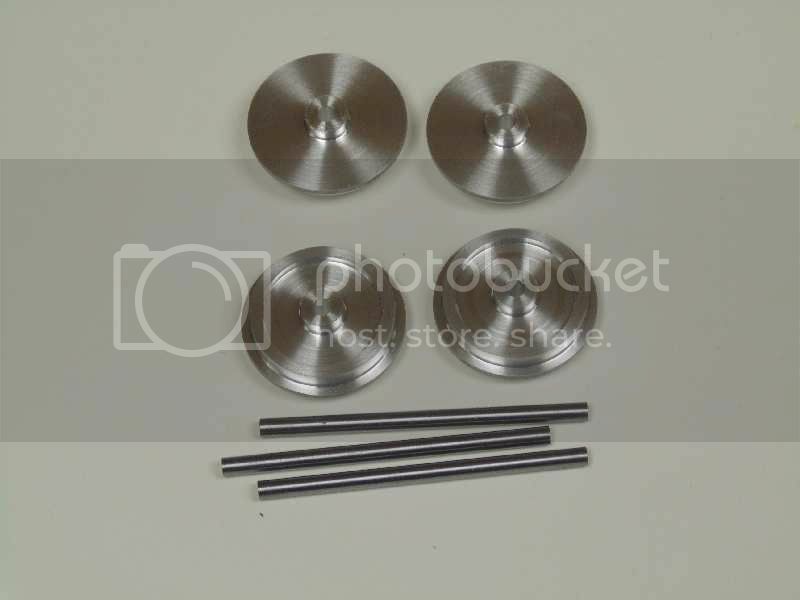 Be sure to use high quality "ground and polished" stock for the crankshaft and axles. G&P is exact diameter, perfectly round and exceptionally smooth. Regular rolled stock will work, but G&P is superior. Use either free machining 12L14 steel or 303 stainless. Next, face off a 3/16" length of 1" diameter stock for the crank web. This web is bronze for a nice contrast. Center drill and tap with 4 x 40. 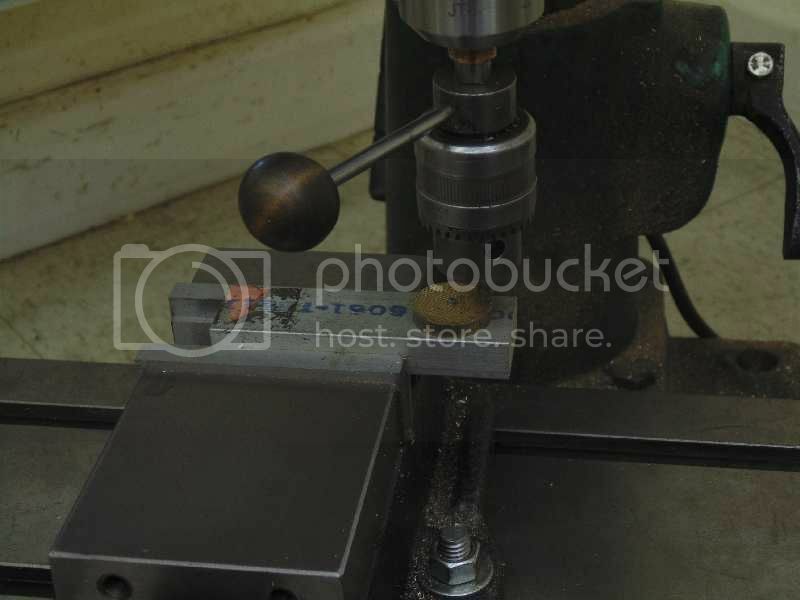 Secure the web blank on a piece of scrap material in the mill vice. Tap with 0 x 80 exactly 5/16" from the center of the main shaft. 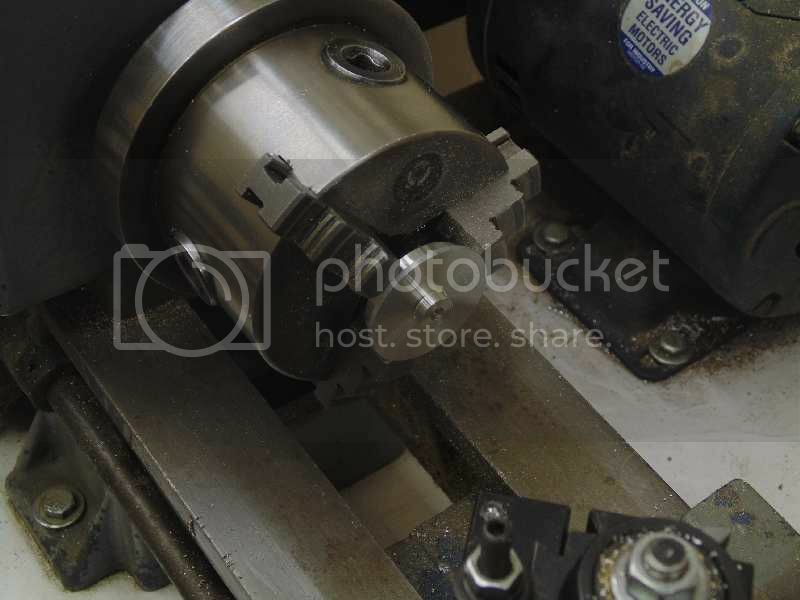 Trim the 4 x 40 and 0 x 80 machine screws to a length of 5/32". "Loctite" (Loctite #680) the crank web to the main shaft. 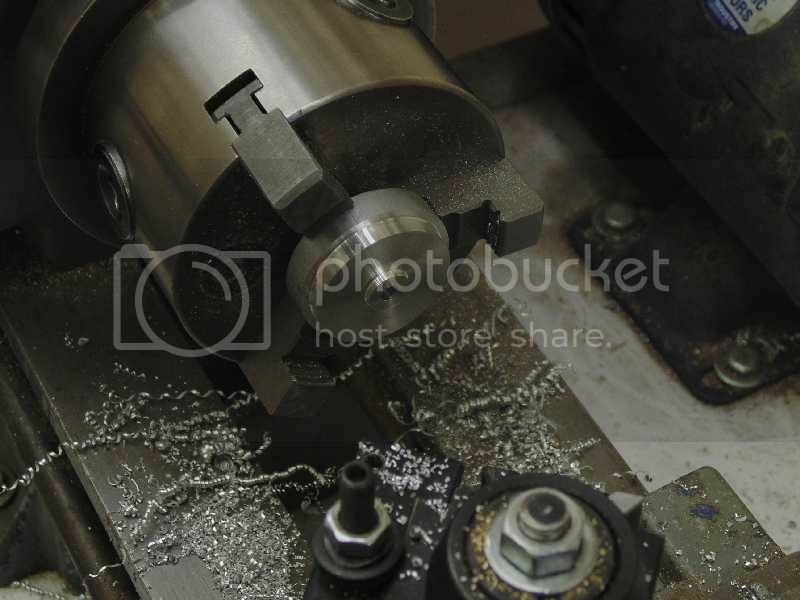 Chuck the main shaft and crank web in the lathe. 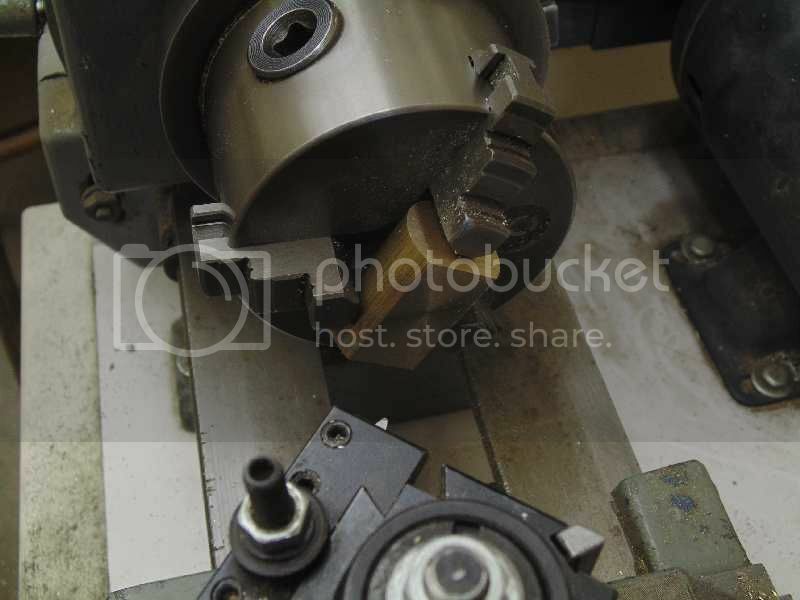 Turn to final diameter and width. 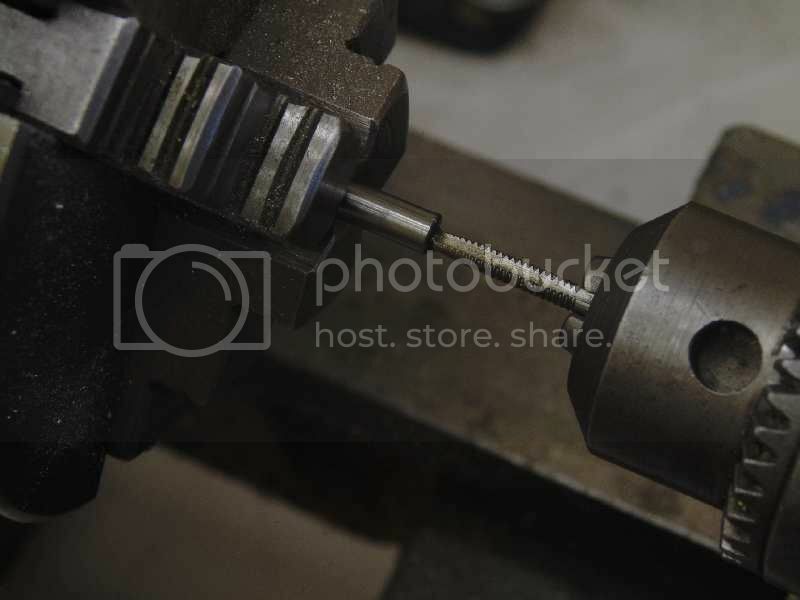 "Loctite" the wrist pin into the crank web and the crankshaft is done. Use Loctite #242 (the red stuff) for these applications. #242 is a high strength threadlocker for close, smooth finish surfaces. Autozone usually carries #242. Time to assemble the rolling chassis. Trim the length of the axles about 1/32" proud of the bearings on both sides. The back-to-back measurement on the wheels is exactly 1.574". While putting the chassis together, bolt on eight angle brackets for the footplate. 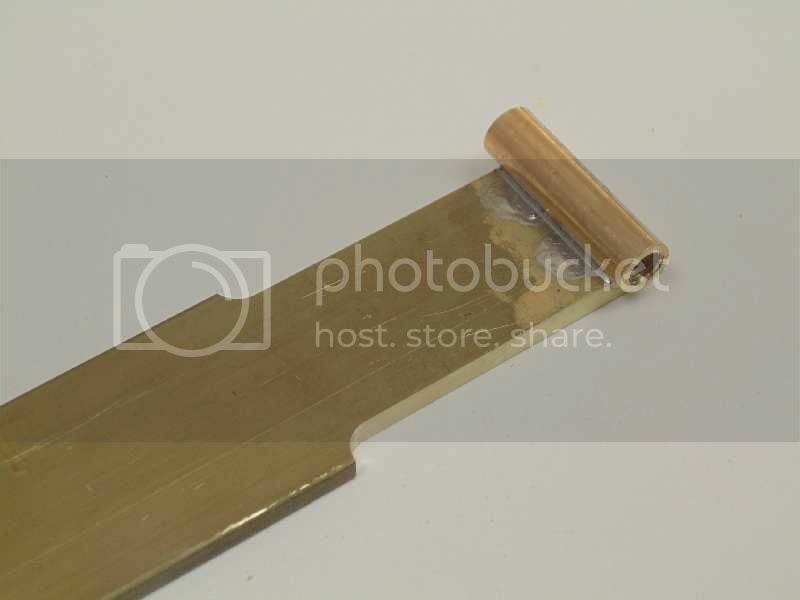 The angle brackets are 1/4" x .025" brass hobby angle drilled for 0 x 80 machine screws. Put a drop of light machine oil on each bearing. It will roll like a champ. Oh my goodness. Look what arrived in the mail today. 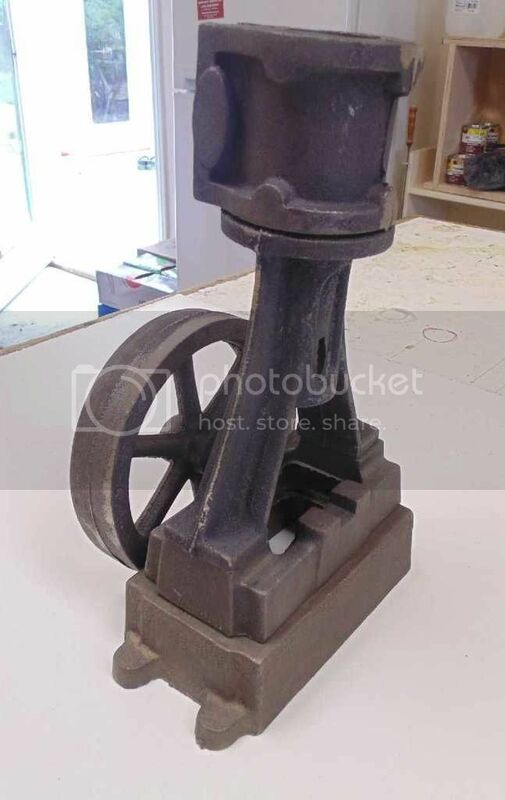 A set of Stuart #4 castings. Ordered these online with Stuart on Monday night and they arrived in Las Vegas Friday morning. Next time is the start of the motor unit. Great progress on your Regal Bob! I'm enjoying your build. Wow.........that Stuart #4 looks like it's about ready to run! 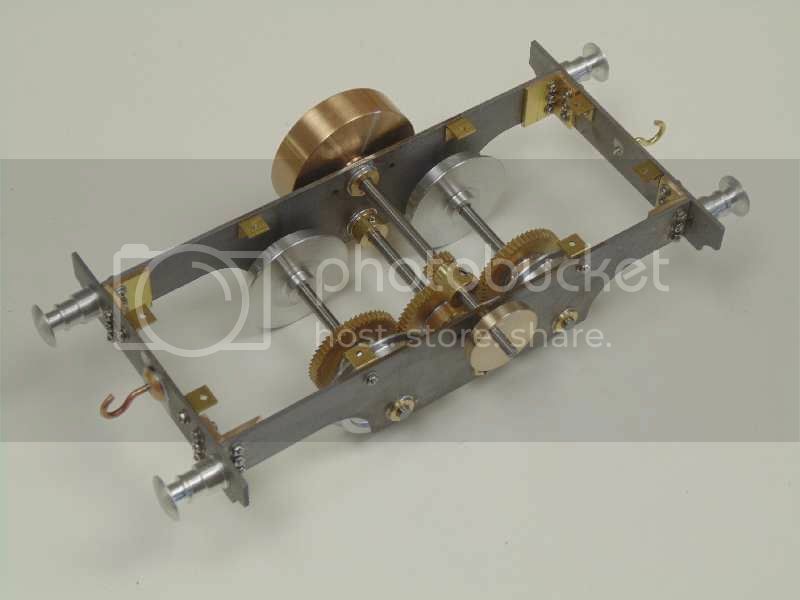 The motor for Regal is a single cylinder, single acting oscillator. 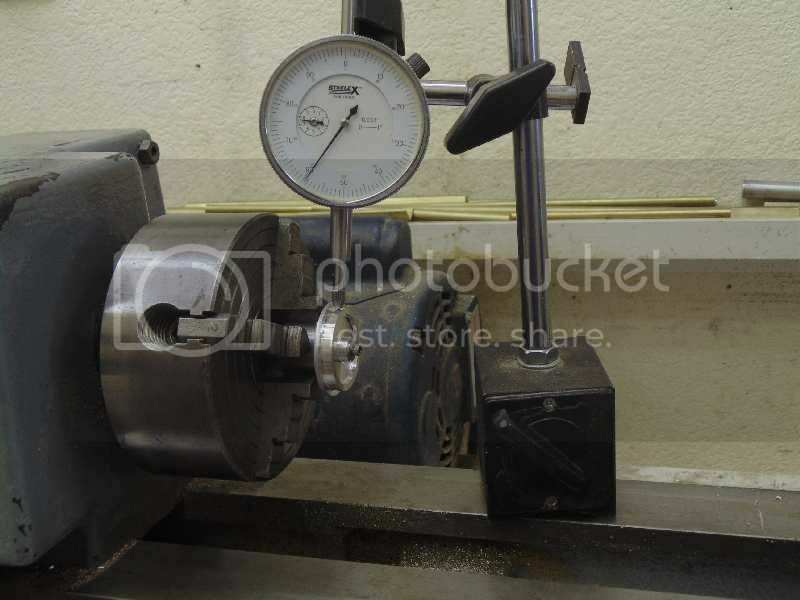 The bore is 7/16" with stroke of 5/8". Oscillators are easy to build and very powerful. "Chip" is the first oscillating locomotive I built, its been running strong for years. Here is Chip at the National Summer Steamup, I think in 2013. 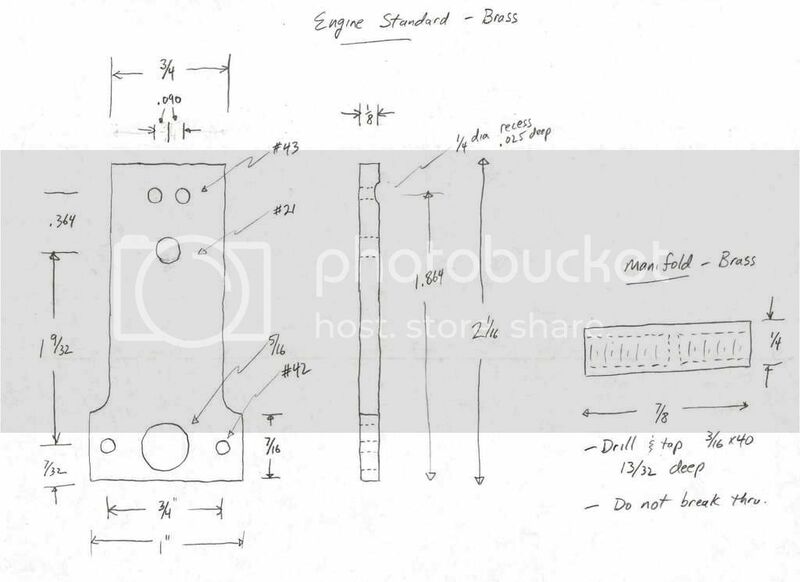 The first part is the engine standard. It consists of the portface and manifold. Here is the drawing. 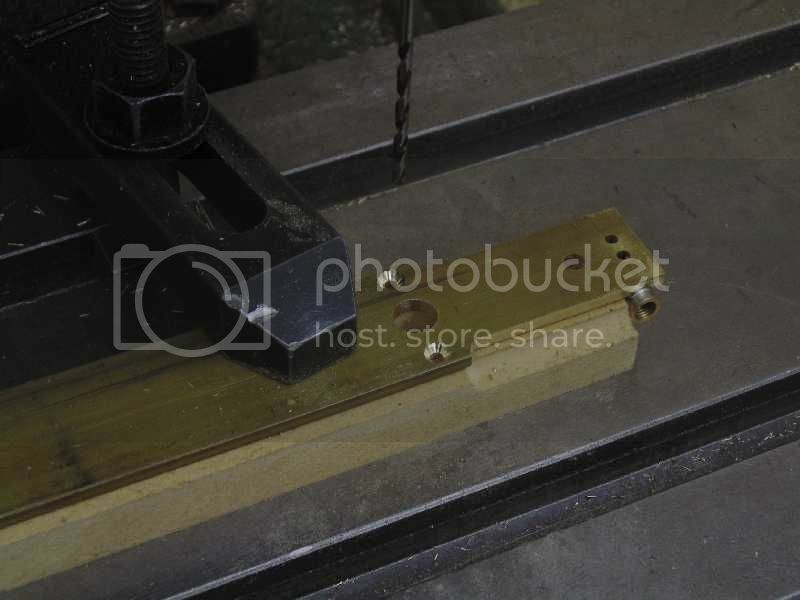 The first step is clamp some 1" x 1/8" brass to the milling table. Profile the sides and cut a shallow recess to receive the manifold. 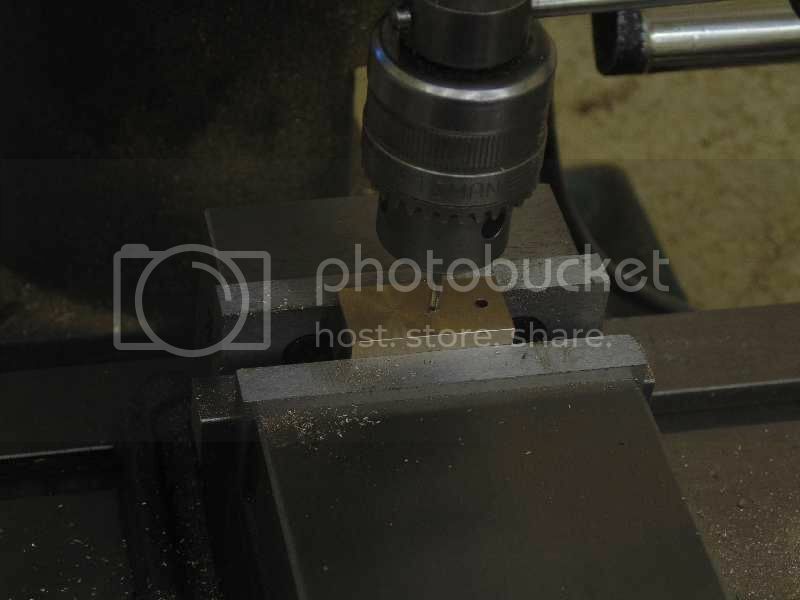 If you don't have a 1/4" ball end mill bit, hand cut the recess with a round file. 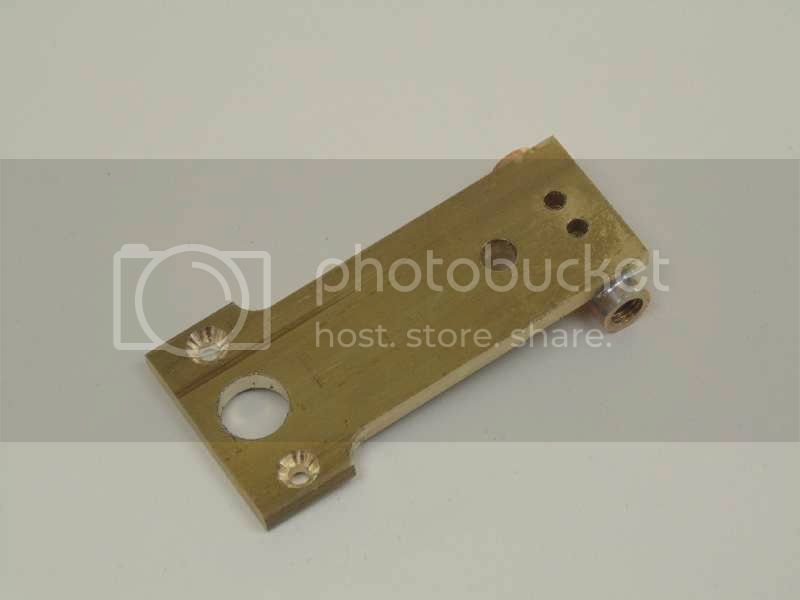 The manifold is 1/4" diameter round brass. Drill and tap both ends with 3/16 x 40 as deep as possible, but don't break thru. Soft solder the manifold to the portface. Flip the standard over and drill all the holes. The two #43 holes at the top of the standard just break into the manifold. Cut the standard off the stock. The standard is not quite finish yet. The finish up comes after the cylinder build. 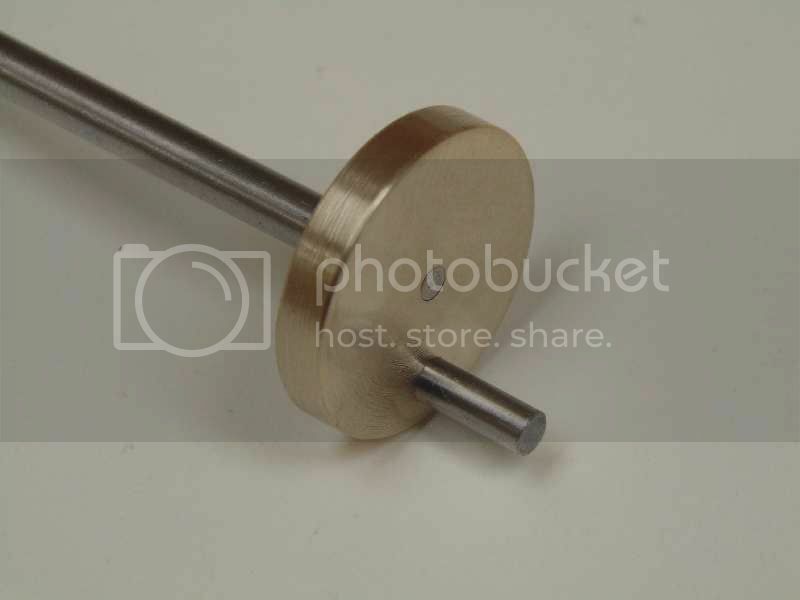 The cylinder is a 1-5/16 long piece of 7/8" diameter bronze. It is usual practice to make mating surfaces from dissimilar metals. 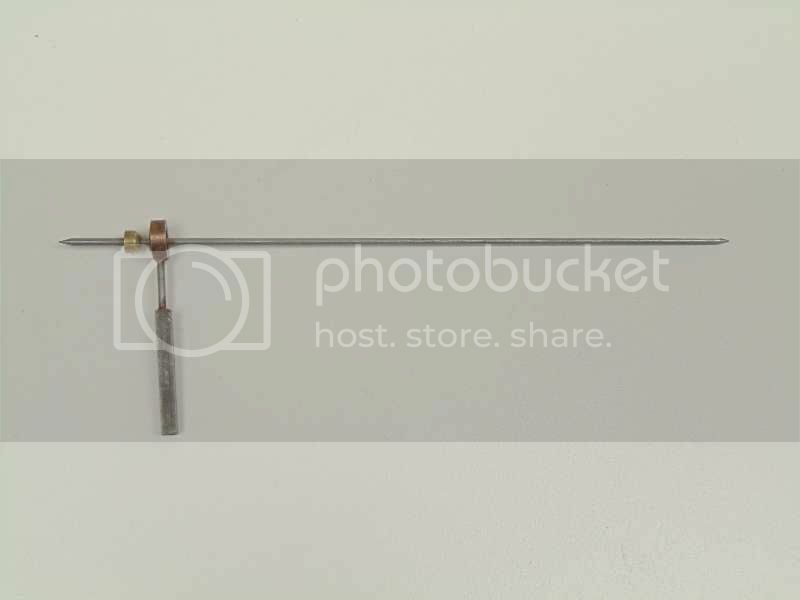 So the standard is brass with a bronze cylinder. There are several grades of bronze. Alloy #932 is the most common form. 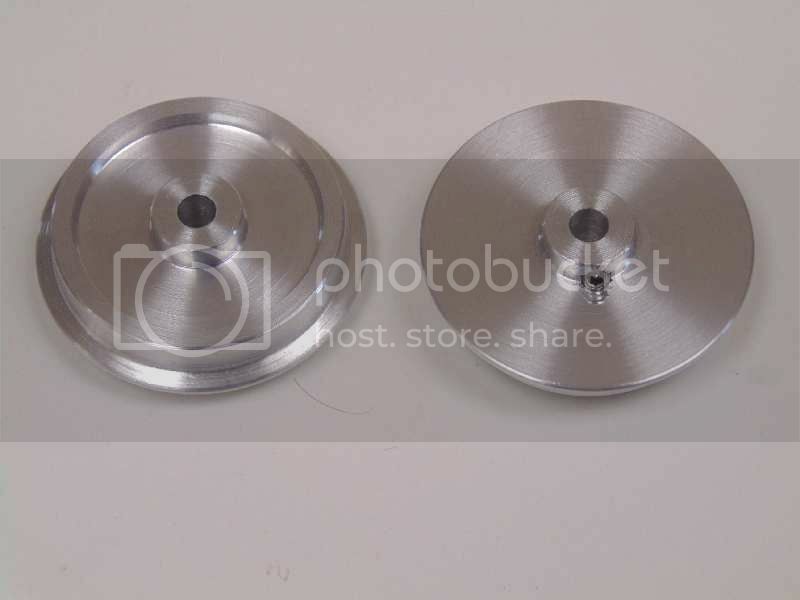 It is a general purpose bearing bronze that is vert durable easy to machine. 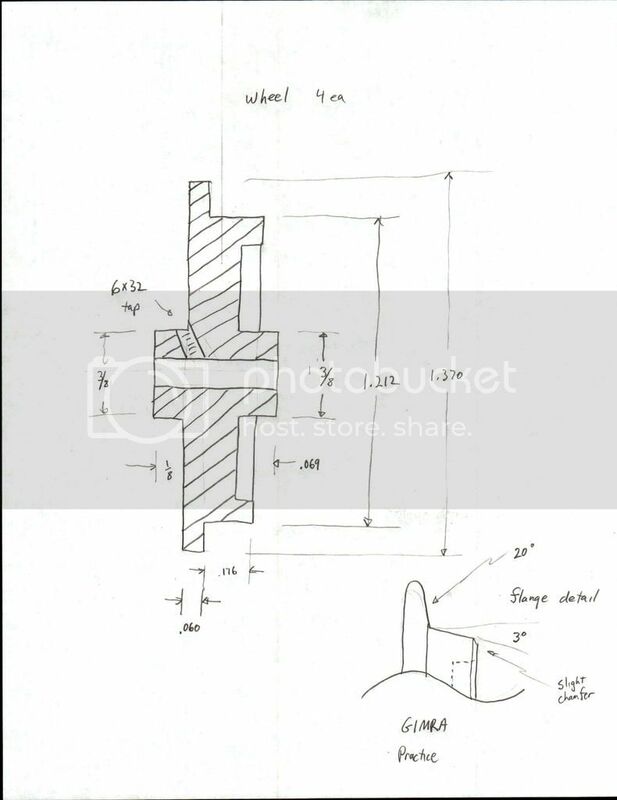 Here is the drawing for the cylinder and top cover. 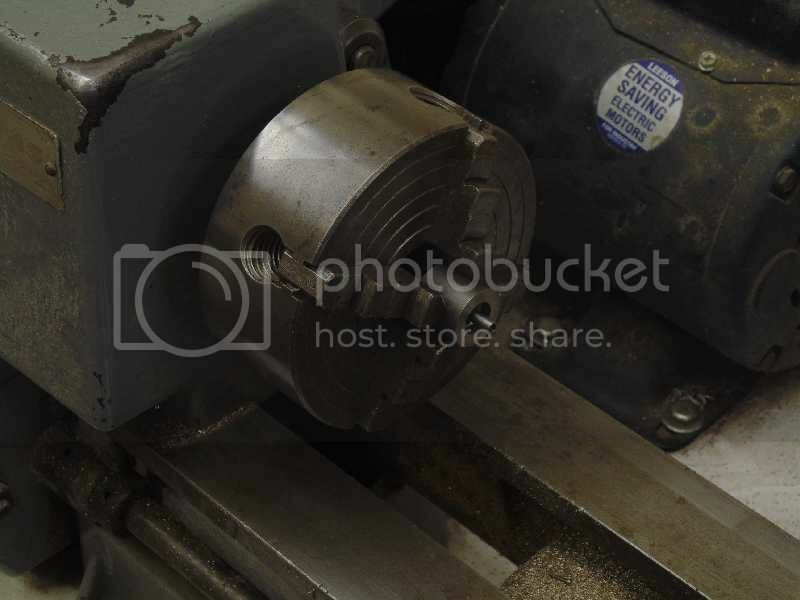 Chuck round cylinder sideways in the lathe and machine one side flat. Machine the other side and port face in a similar manner. 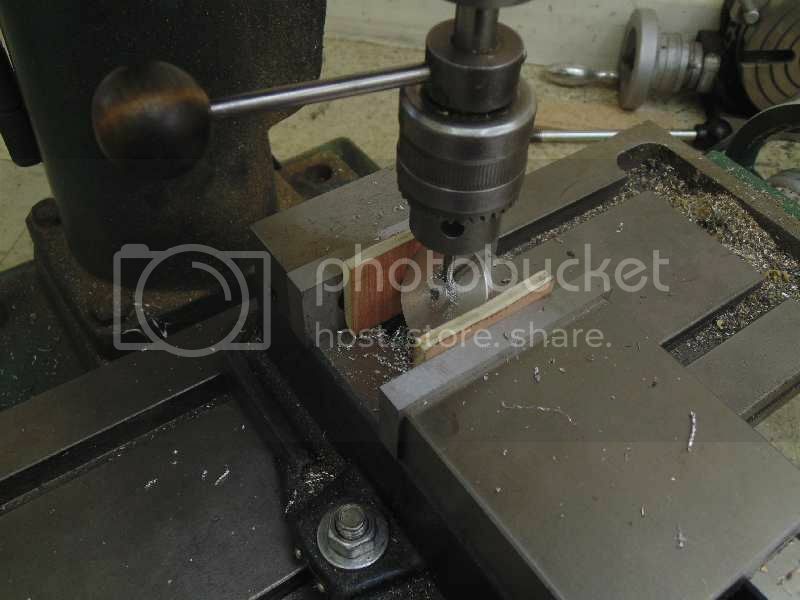 Clamp the cylinder in the mill vice to drill the port hole and tap for the pivot pin. 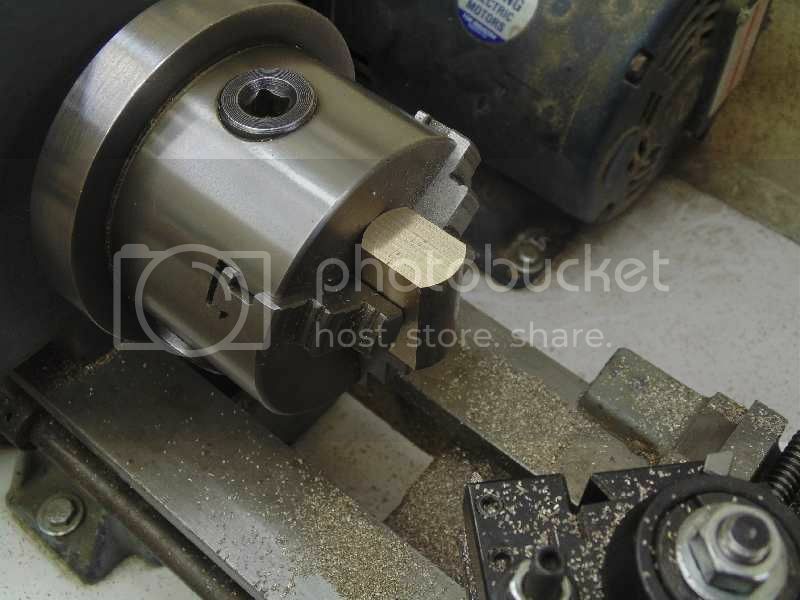 Make a very small center drill on the bottom of the cylinder for the bore center. 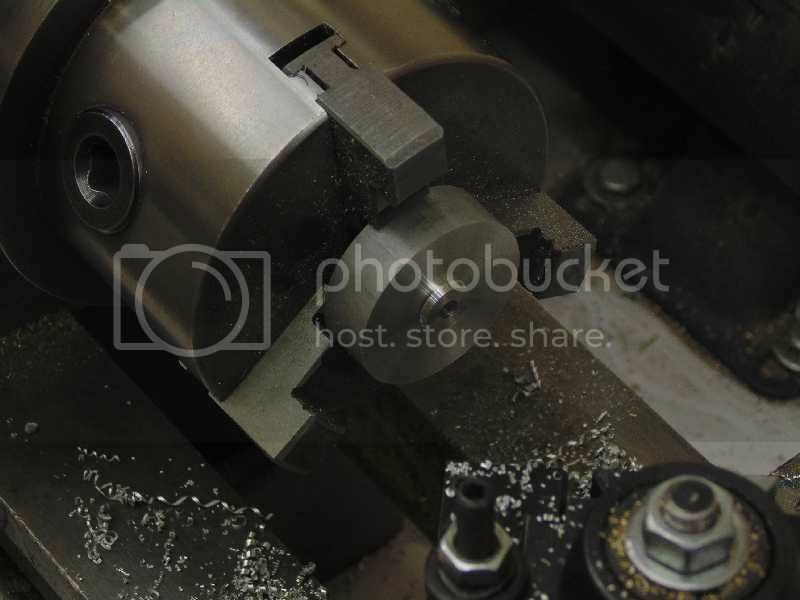 Since the cylinder is an odd shape, it will not chuck properly in a 3-jaw universal chuck. Use a "wiggler" center finder to center the cylinder in the 4-jaw independent. This is the wiggler I made many years ago. 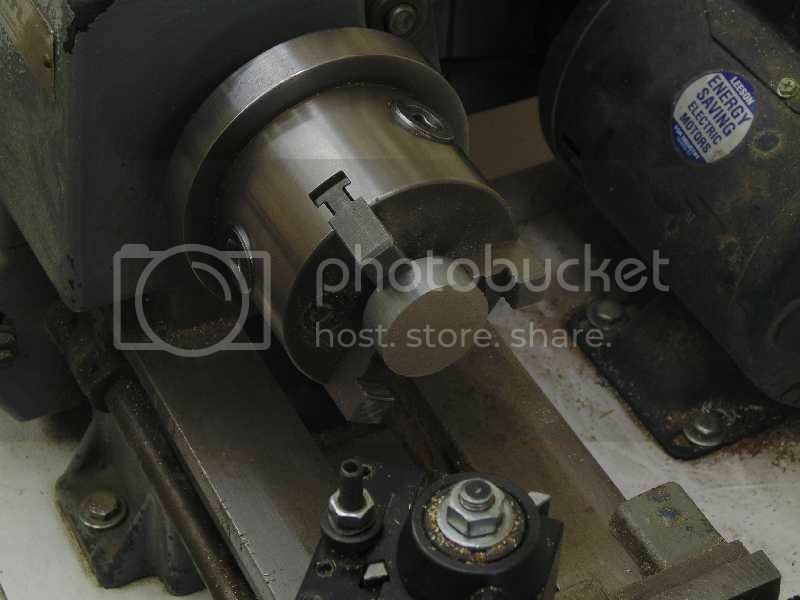 Use the wiggler to adjust each chuck jaw to center the cylinder. This is enough for now, so we will end here and finish the cylinder next time. Somehow I missed this when you began the build Bob. What a neat little engine. I will be checking in regularly now! !